I was woken up by a loud conversation the next morning. The voices were those of my family members and of two other people. One voice was familiar, the other one, not so much. Throwing on some clothes, I headed out to see what all the noise was about. In the living room were two men- one was my mother’s old friend, Sebastian Vanderburg, who has worked with the Hidden Springs police department for as long as I could remember. The other man was younger and unfamiliar. Despite his younger age, he had a much stricter appearance and I got the feeling he wasn’t here just to chit-chat. I noticed how she used Sebastian’s title and not his name. The other man’s presence must have been the reason for that- she didn’t want him to think Sebastian had any kind of impartiality to our family. For someone who wasn’t really in the know of recent events, my mother had good gut instincts. “Good morning, mom, dad, Gerald. Good morning Captain Vanderburg and Deputy Westen. How may I help you?” I greeted the two men. Considering the recent events, there were few good reasons for them to be here, but it still wouldn’t hurt to be polite. “Ms. Meadows, I assume you are aware of the recent passing of your CEO. And of the leak of some very sensitive information regarding the company you are currently on the payroll of,” the deputy didn’t waste time. This isn’t going too well, I began to think. There was something about the way that deputy looked at me that didn’t sit well with me. It was almost like he was trying to trip me up. “Ms. Meadows, where were you this Tuesday night, from 5 to 12 pm?” he asked without breaking eye contact. Oh well, we always knew this was a possibility, I thought. They were on to us. “I worked late at the office that day. I didn’t leave the building until late that night,” I told him. It wasn’t a lie, really. I was at the office, after all. “I’m sorry, but shouldn’t she have a lawyer for questioning?” my father chimed in. He was a farmer, yes, but that didn’t mean he didn’t know quite a bit about the legal system. Well, that was just weird. “I was alone, until I met with Irene back at the office. We came here after work.” David just entered the room, but he also quickly caught on that something was weird here. “But why does it matter? Am I under suspicion of anything? Or is she?” He pointed at me. “Wait, why would you think my mother committed murder just because she lied about being with me that night? Maybe she had good reason to say that?” David defended and I didn’t blame him. This thing the deputy did? It was a trick- he knew perfectly well that Selma Collier wasn’t with David that night. But how? “Yes, it is very suspicious,” I admitted. “But it still doesn’t mean she actually did it. The Colliers have a lot of enemies. It wouldn’t be out of character for someone to try and frame her in the midst of all this.” I didn’t know why I was defending Selma Collier, but something about the whole situation just didn’t sit well with me. “Someone like, say, a young woman whose family was robbed by the company and who has been working at said company since high school?” the deputy looked at me. He had a good point. Why would she lie about this? “Well, no,” the deputy admitted. “In fact, from what he tells me, the woman looked completely baffled when presented with the information that she was a suspect for poisoning,” Captain Vanderburg added. The deputy listened to all of us carefully, taking in as much information as he could. Finally, he nodded and got up. “Alright, then, I’ll go start up the car. Simon, Celeste, it’s been good seeing you two. And Deputy Westen, let me tell you, no one in this family would commit anything illegal. That I can vouch for.” He headed out for his car. “So, she’s still in trouble…” David frowned. My jaw dropped to the floor. How could he know about this? Was someone tailing us the whole time?! “You know about this?! How are you not arresting us?” I blew up. And with that, he left, leaving both of us and my family just standing there dumbstruck. Well, considering how it was his discovery that started off this whole mess, he had a right to know. Naturally, neither of my parents was happy to hear that their kids were leading an illegal investigation and that their daughter broke into her boss’s office while he was gone. However, they understood why we felt like we needed to do those things. As if on cue, his phone rang—Roman called him first. “Gerald, are you able to talk right now? I have some information that may interest you on this? “Hold on, can I put you on speaker? My whole family and David are here and they’re interested in this too,” Gerald explained. The hacker clearly agreed, and Gerald set the phone on the table for us all to hear his news. “Who could make something like this? I know I can’t,” Gerald admitted. “Maybe we can find her?” I perked up. This whole fake crime situation was getting out of hand: it was one thing to get the Colliers in jail for something they actually did. But to frame the wife for the husband’s murder was a little too much. “I don’t know. She wasn’t that young when she worked for us. She’s probably way retired by now and really hard to find, but I can take a look at what happened to her after the project,” Roman agreed. He left the phone for a while and we could hear him asking Tia for his old research papers. “You think Selma was involved in Lionel’s illegal activities?” I was curious. “Well, the server leak didn’t really have her name involved in anything, did it? But, it is safe to assume she knew some things about her husband schemes,” Gerald supposed. “Well, that definitely gives whoever engineered this whole situation more incentive to frame her, then,” my father mused. “Why would she hide that kind of skill? Isn’t such computer literacy really useful for scientific research?” David was incredulous. “Appaloosa Plains! ?” my parents both jumped a little. “And you say her name was Aileen?” my mother was on the edge of her seat. “Umm, yes. Why, do you know her?” Roman was confused. “What’s happening? How do you know this person?” David looked around confused. “My maternal grandfather was married to and embezzled by a woman named Aileen, years ago. And they lived in Appaloosa Plains. I mean, as soon as they discovered her scheme, that Aileen fled town, so since this woman was from Appaloosa Plains too and trying so hard to maintain her ‘nice old lady’ image, maybe she was that same person,” I explained. “Wow… your family seems to have this kind of luck with people, doesn’t it?” he was amazed. “Brandon Lewis. He owned a ranch in Appaloosa Plains until his passing several years earlier,” Mom explained. Everyone paused, mulling over the information. “That was unexpected,” agreed Dad. “So, she’s targeting my family? Where is she anyway?” David requested. “There isn’t really much information about her after the project’s end, to be honest. I think she moved away from Hidden Springs, though. I can look into this further, but hunting down her current location will take a couple of days,” Roman explained. “That would be most welcome. Thanks for all your research, Roman,” I thanked the hacker. “You guys are most welcome! Take care. I’m going to go for now—Tia’s making her famous lasagna!” the guy was clearly happy to be back home and I kind of felt bad for our family distracting him from spending all the time with his family. “We wait for Roman’s information on Aileen’s whereabouts,” my mother offered. “And see where that leads,” Dad added. “This could take a while though,” I felt impatient. I wanted to know what was going on and I wanted to know now! “Anyway… why don’t all of you get ready for breakfast? Or rather, lunch, by now,” mother got up and headed toward the kitchen. “Yes, those detectives woke us all up rather early, didn’t they?” Dad headed off to get properly dressed. Gerald just went back to his room, to read some article he’s already been reading before the detective’s arrival. I watched David with anticipation and some worry. No doubt, he wasn’t taking all this information about his family too well. For his part, however, he just started playing with Gerald’s cat. This in itself surprised me- Murka was a former stray and she usually clung to my brother, chasing away others. But here she was, happily purring in David’s hands, after approaching him herself. He looked relaxed, if anything. I looked out the window, which looked out on the Hidden Springs lake. Hmm, we couldn’t do much from here, could we? “Yeah. It probably would have been similar if our original plan worked,” he admitted. What I didn’t say was, if Selma wasn’t involved in Lionel’s criminal activity, someone was just going after the Colliers as a family. Which meant that, eventually, they’ll come after David too. And I wanted to make sure the police caught them before they got the chance to do it. I added in the questions from Dandylion240 and Stormysims! Huge thanks to both RosemaryMarie and RaymondSanti who nominated me for this! They both have really cool stories on their respective blogs- if you aren’t reading them, check them out! Also, I was nominated by Dandylion240 at her Bring Me Back To Life legacy and by StormySims at The Life and Times of the Willows. They both have amazing stories going on, which are very captivating. Well, it is of course an award for bloggers from other bloggers. It is a beautiful way to share all the amazing things other bloggers do and write about. To recognize their efforts in inspiring others to do what they love. Thank the person who nominated you and add a link to their blog. Nominate 11 bloggers and add their links. 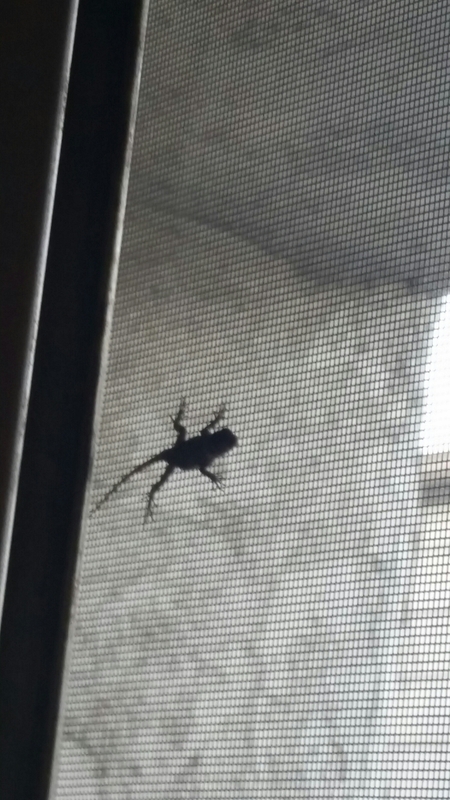 It’s actually a picture of the lizard that decided to “visit” my apartment! If you could have personally witnessed anything in history, what would it be? Hopefully, something that people still wonder about, like how the pyramids were built, or any of those “alien encounters”. Just to quell my own curiosity. If you could be any age for a month, what age would you choose? If I could also live the way I lived at that age, I’d love to go back to being 6. No school, my best friend lived across the street, I had fun with my neighbor’s grandkids who came to visit for the summer…. it was a good time. I’d have to go with this dish called Ghormesabzi from a local Mediterranean restaurant near me. It was pretty good, but a bit too heavy on the spices for me. Probably Karlsson-on-the-Roof, by Astrid Lindgren. It’s so funny! Yes, I do. Never saw any, but that doesn’t mean they don’t exist. What is the longest you’ve gone without sleep? Probably around 60 hours? Back in high school, I had to go on this overnight trip to the local uni. Due to some nerves, I ended up not sleeping the night before the trip. Once at the uni, I tried to compensate the lack of sleep by consuming way too much coffee, which in turn led to more insomnia… Let’s just say, I was lucky none of the counselors there thought I was under the influence, because I was practically a zombie! Honestly, I usually can’t taste the difference between them. I prefer Cherry Coke or Dr. Pepper, usually. I went to a live concert with my family. And afterwards, to a restaurant! New Years Eve! Mostly it’s because in Russia, which I’m originally from, it was The Holiday! It still is in my family, we get together, watch holiday concerts, eat, drink. It’s a fun old tradition. My laptop, mouse, jar with pencils and table lamp. These characters basically come to live in my head and they want their stories told! The least I can do is write them. One of your bad habits? What do you want the most right now? A job. A real money-earning job. Preferably one that I can do fairly well and where I get along with my coworkers and boss. Something you never leave home without? My phone. If I ever leave my phone at home, I feel lost without it. If you could ask any question to anyone and get a truthful answer, what would you ask? That’s a tough one. I might ask my former high school crush whether it was ever possible for anything to happen between us relationship-wise. But then again, I was definitely not mature enough for a relationship back then. Showers. They just take less time. Either 4 or 7. I can’t really explain why. If you had the chance to torture your worst enemy, would you? Nope. Even if I totally hated them, the most I’d do is get into an actual fight with them. But torture is immoral and, as many studies show, it’s pretty useless. What do you admire in your friends? They give me a new perspective on life. I mean, the other day, my closest friend drove a really long distance to come see me. And my online friends are always improving my mood when I’m down. You’re all wonderful. If you could invent anything, what would it be? Something that makes people less prone to hate one another? If that were possible. Imagine how much humanity could achieve if there was no hatred, racism, bigotry? Given the chance to rule the world… would you? No! That is way too much responsibility for one person. And I’m definitely not someone who could do such a difficult job. Anything but orange and pink. Not too much. It’s pretty exhausting. If you could go anywhere, where would it be? Someplace cold, like Sweden, maybe. Or someplace in the UK. How long have been playing the sims? Since the summer of 2013. What motivated you to start writing? Seeing other people’s stories and wanting to try a hand at creating a tale myself. If you could meet anyone in from the past, who would it be? Perhaps, my great grandmother Sophia. She was a very wise and amazing woman, but she passed away when I was only four. I don’t really have a favorite song. I have been pretty obsessed with The Cat Empire lately though. Night. I feel much more productive at night. Do you plan out every detail of the stories you write or do you just let the story take you to unexpected places? I try to plan, but in the end it still changes. So, most of the time, the end result of the story is way different from what I originally had in mind. Do you like to write first or third person? I generally find 1st person easier, since you get to see things from the character’s perspective. Although, lately I’ve been trying a hand at 3rd person narrative. If you could do anything right now, what would it be? I actually really want to go to the beach right now. Because it’s so hot today and the beach is always windy and cool. If you could be anywhere in the world (or fictional world) right now, where would you be? Just anyplace really calm and cool. Preferably, not in California. Although, the Shire from LOTR would be a pretty neat place to be. What drew you to start playing The Sims, TS2, TS3 or TS4? I started playing the mobile Sims Freeplay. And then, for my birthday, I got the actual Starter Pack from the Sims 3. I definitely love mysteries and adventures. My least “favorite” is romance, since I find it really difficult to write believable romance scenes. If you could make any one of your characters in any of your stories come to life, who would it be, and why? From this story, Celeste, since she is very caring and understanding, no matter what. From my Tumblr story, The Roommies, I’d totally love to make Bernardo Vida real, since he seems to be someone I’d really get along with. When writing your story on a blog, do you prefer to write on a white background, a black background or a colored background? Why? I almost never use the WordPress blog for actual writing, I just use Microsoft Word. And lately I’ve been using this pale green background while writing, since it’s supposed to be better for eyes. I prefer silence while writing. I can have a lot of noise going while taking the pictures though. If you were a Sim, would you choose to be a PlantSim, Zombie, Alien, Werewolf or a witch? Why? I’d love to be a Witch. So many possibilities there. If you could be any animal, what would it be, and why? A cat. They have really cool physical abilities and everyone loves them. IRL, it’s winter. In game, Summer or Spring. What is your favorite Sims world? Appearance-wise, Isla Paradiso is the most beautiful, even though it lags so much. Otherwise, I like Monte Vista quite a bit. What has been your favorite Sims challenge that you either have done before or like to read? I like the Bring Me To Life challenges, where you have to resurrect an EA ghost and let them live a full life. Do you have any favorite characters in your own stories? Who? What are your favorite genres to read or watch? Which fictional character do you wish you could be real life friends with? Would you rather land the perfect job or find true love? Do you cook or bake? If not, would you want to learn how to? What is the one thing you absolutely can’t live without? Which country do you most want to visit? Are you a day or a night person? Would you want to become famous? What do you like the most about gaming?